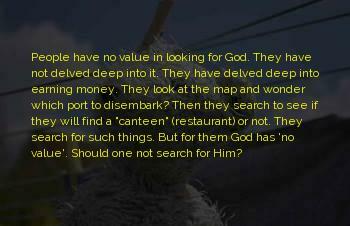 People have no value in looking for God. They have not delved deep into it. They have delved deep into earning money. They look at the map and wonder which port to disembark? Then they search to see if they will find a "canteen" (restaurant) or not. They search for such things. But for them God has 'no value'. Should one not search for Him? 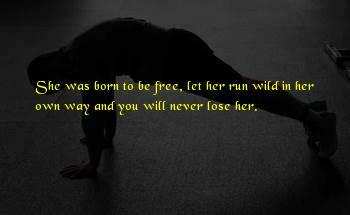 She was born to be free, let her run wild in her own way and you will never lose her. Drustan raked a hand through his hair and fumbled in the dark for the door. When it didn't budge, a part of him was unsurprised. Yet another part of him met the fact with a kind of glad resignation. She wanted battle? Battle she would get. It would be a pleasure to have it out with her finally. Once he'd ripped the door from the framing, he would exact vengeance upon her wee body with gleeful abandon. No more honorable I-won't-touch-you-because-I'm-betrothed. Nay he'd touch her. Any damn place and any damn way he wanted to. As many times as he wanted to. Until she begged and whimpered beneath him. She'd been trying to drive him mad? Well, he was giving in to it. He would act like the animal she made him feel like being. The hell with Anya, the hell with duty and honor, the hell with discipline. He needed to tup. Her. Now. How did you know He was God?' Gamache asked. 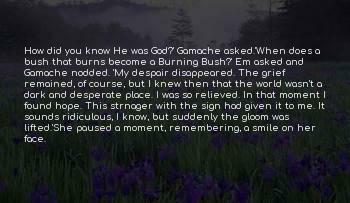 'When does a bush that burns become a Burning Bush?' Em asked and Gamache nodded. 'My despair disappeared. 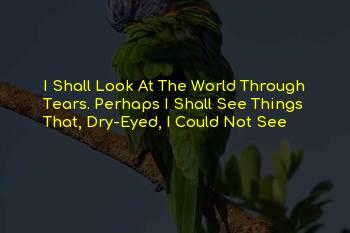 The grief remained, of course, but I knew then that the world wasn't a dark and desperate place. I was so relieved. In that moment I found hope. This strnager with the sign had given it to me. It sounds ridiculous, I know, but suddenly the gloom was lifted.' She paused a moment, remembering, a smile on her face. Harsh discipline doesn't benefit a student, but social problem solving does. Are strict rules and harsh discipline the keys to successful education? No, they aren't. In fact, harsh discipline is counterproductive to learning. Discipline can make a student focus, but it also gives him anxiety and low self-esteem. 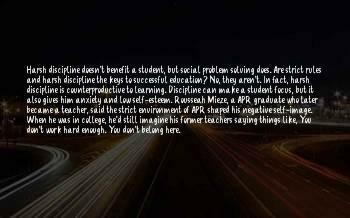 Rousseah Mieze, a APR graduate who later became a teacher, said the strict environment of APR shaped his negative self-image. When he was in college, he'd still imagine his former teachers saying things like, You don't work hard enough. You don't belong here. 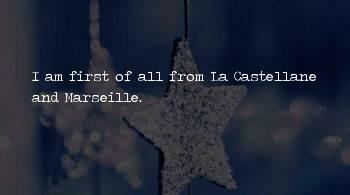 I am first of all from La Castellane and Marseille. There's nothing to be ashamed of here. 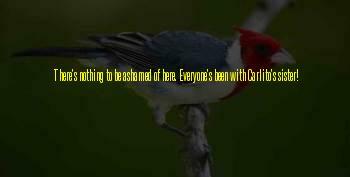 Everyone's been with Carlito's sister! 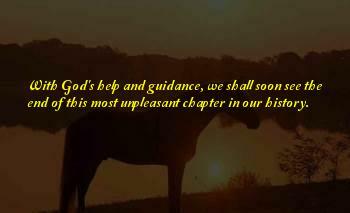 With God's help and guidance, we shall soon see the end of this most unpleasant chapter in our history. 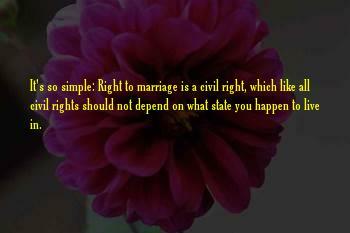 It's so simple: Right to marriage is a civil right, which like all civil rights should not depend on what state you happen to live in. I do sense that the financial system is under the gun. 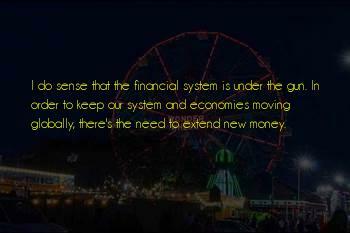 In order to keep our system and economies moving globally, there's the need to extend new money. She waved, laughing, waiting for him to go zooming past her. Instead he slowed, then came to a stop right in front of her. "What are you doing?" she demanded, as he put his foot on the asphalt. She pointed to the finish line, a scant hundred yards away. "Go." People around them started screaming. 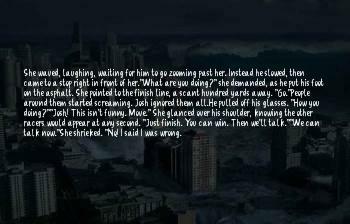 Josh ignored them all. He pulled off his glasses. "How you doing?" "Josh! This isn't funny. Move." She glanced over his shoulder, knowing the other racers would appear at any second. "Just finish. You can win. Then we'll talk." "We can talk now." She shrieked. "No! I said I was wrong. I said I loved you. What more do you want?" "You," he said. "For always." "Yes, yes. You can have that. Now go. Cross the finish line. It's right there. Can't see it? Hurry." "You'll marry me?" The man next to her turned. "For God's sake, lady. Marry him already. 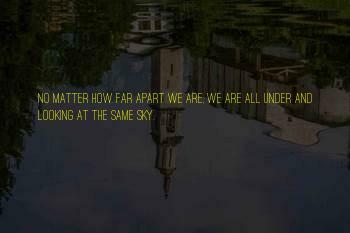 No matter how far apart we are, we are all under and looking at the same sky. 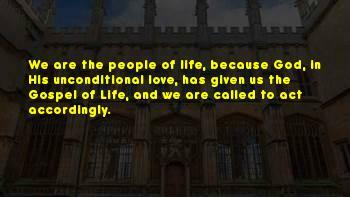 We are the people of life, because God, in His unconditional love, has given us the Gospel of Life, and we are called to act accordingly. 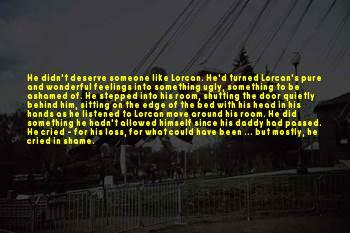 He didn't deserve someone like Lorcan. He'd turned Lorcan's pure and wonderful feelings into something ugly, something to be ashamed of. He stepped into his room, shutting the door quietly behind him, sitting on the edge of the bed with his head in his hands as he listened to Lorcan move around his room. He did something he hadn't allowed himself since his daddy had passed. He cried - for his loss, for what could have been ... but mostly, he cried in shame. 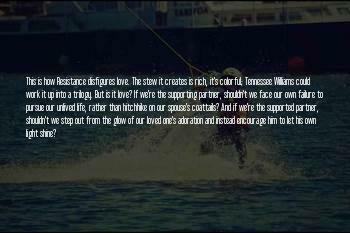 This is how Resistance disfigures love. The stew it creates is rich, it's colorful; Tennessee Williams could work it up into a trilogy. But is it love? If we're the supporting partner, shouldn't we face our own failure to pursue our unlived life, rather than hitchhike on our spouse's coattails? And if we're the supported partner, shouldn't we step out from the glow of our loved one's adoration and instead encourage him to let his own light shine? 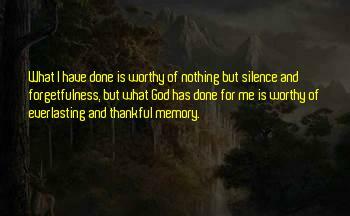 What I have done is worthy of nothing but silence and forgetfulness, but what God has done for me is worthy of everlasting and thankful memory. 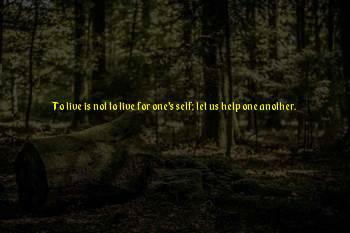 To live is not to live for one's self; let us help one another. Dates used to be made days or even weeks in advance. 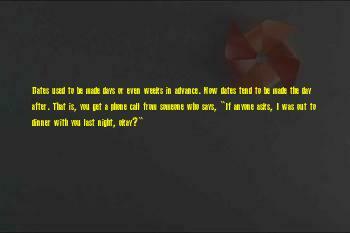 Now dates tend to be made the day after. That is, you get a phone call from someone who says, "If anyone asks, I was out to dinner with you last night, okay?" 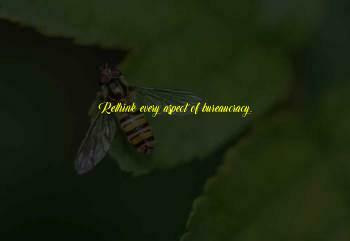 Rethink every aspect of bureaucracy. 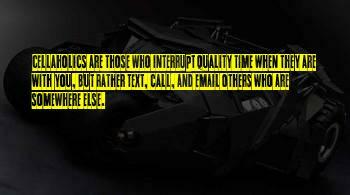 Cellaholics are those who interrupt quality time when they are with you, but rather text, call, and email others who are somewhere else. 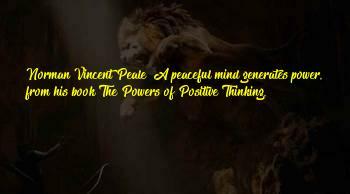 Norman Vincent Peale "A peaceful mind generates power." from his book The Powers of Positive Thinking. 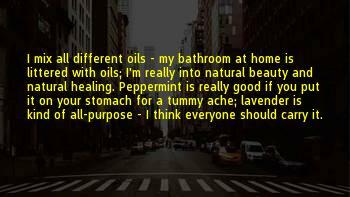 I mix all different oils - my bathroom at home is littered with oils; I'm really into natural beauty and natural healing. Peppermint is really good if you put it on your stomach for a tummy ache; lavender is kind of all-purpose - I think everyone should carry it. 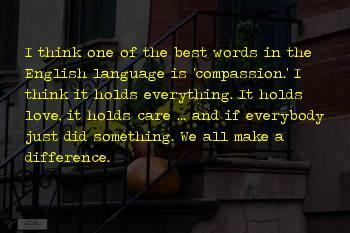 I think one of the best words in the English language is 'compassion.' I think it holds everything. It holds love, it holds care ... and if everybody just did something. We all make a difference. 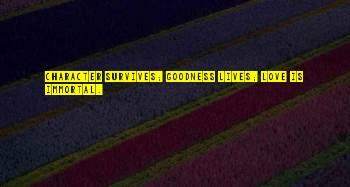 Character survives; goodness lives; love is immortal. 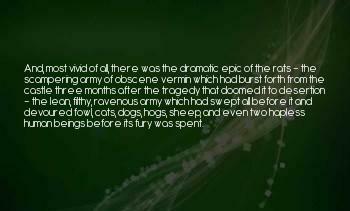 And, most vivid of all, there was the dramatic epic of the rats - the scampering army of obscene vermin which had burst forth from the castle three months after the tragedy that doomed it to desertion - the lean, filthy, ravenous army which had swept all before it and devoured fowl, cats, dogs, hogs, sheep, and even two hapless human beings before its fury was spent. 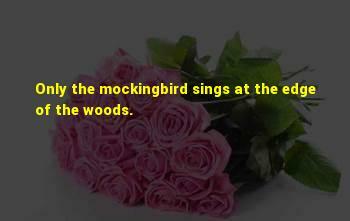 Only the mockingbird sings at the edge of the woods. Engaged," he said bitterly. "Everybody's engaged. 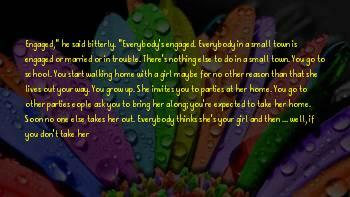 Everybody in a small town is engaged or married or in trouble. There's nothing else to do in a small town. You go to school. You start walking home with a girl maybe for no other reason than that she lives out your way. You grow up. She invites you to parties at her home. 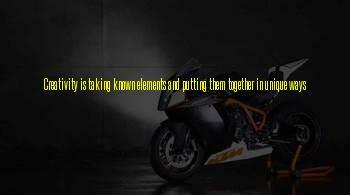 You go to other parties eople ask you to bring her along; you're expected to take her home. Soon no one else takes her out. Everybody thinks she's your girl and then ... well, if you don't take her around, you feel like a heel. And then, because there's nothing else to do, you marry. And it works out all right if she's a decent girl (and most of the time she is) and you're a halfway decent fellow. No great passion but a kind of affectionate contentment. And then children come along and you give them the great love you kind of miss in each other. And the children gain in the long run. I think everybody must be aware that this society is a whole lot shakier now than it was before the war. 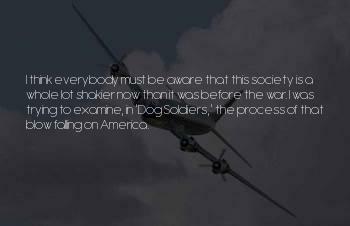 I was trying to examine, in 'Dog Soldiers,' the process of that blow falling on America.